October 13 , by Barbe Saint John. BeadlustÂ – Follow this beaded pathway as it meanders through the process of creating beadwork, books, paintings and who knows what else. Bead artist, Robin Atkins, invites you to join in her journey. Â Even though I don’t do beadwork or beadembroidery anymore, I still love to see what others are doing with it. Robin’s blog is not only visual eye candy but its inspirational as well. 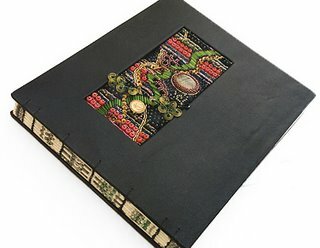 Her beaded journals are just amazing-such as the one pictured which you can view here! ……She has a website where she sells beads, supplies, art and her books. You don’t do beadwork anymore? Is such a thing even possible? If a day ever went by that I didn’t pickup a bead or two I would cease to exist. Hit send to soon. I should mention that I can’t keep up with my own blog since I’m too busy beading. So on that note I guess I’m glad that you were able to give up beading because we get to read your blog more often that way. Hey! Imagine my delight to “google” myself this morning (a once-in-a-while morning coffee pastime), and find your site with a link to my blog and picture of “Money Madness.” WOW! Thanks! Only thing is, the link didn’t work… If you’d like to read about the pictured piece, try this link: http://beadlust.blogspot.com/2007/10/beading-for-change-bjp-augusts-page.html Sorry you don’t have time to bead anymore… but thanks for the site! Thanks Anne! My passion has turned from beadwork to making found object jewelry. I love the challenges that presents. But I still have about 40lbs of seedbeads LOL, I’m sure I’ll pick up a needle and start beading again one day! Your work is gorgeous, so I had to share! Thanks for letting me know and I fixed the link so now they can read that post. Keep up the gorgeous work and inspiration!!! I’m so glad to hear that I am not the only one who loves to bead!!! I am the only one in my area that uses seed beads to embroider gorgeous evening bags that were used for local proms last year!!! That has evolved to making totes and even sports team totes and purses!!!! The younger set is where I found my sales last year, but everyone who sees them oohs and awes, but I can,t seem to enjoy any success with the over 17 to 40 crowd!!! I love hearing about everyones projects and what their passions for their craft are11 thanks for an inspirational site!!!!!! !